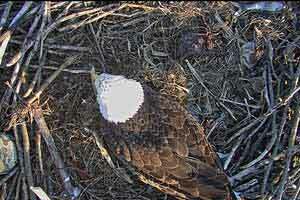 The in-nest eagle camera provides a rare perspective into the day-to-day life of the bald eagles. Of particular interest is their diet. 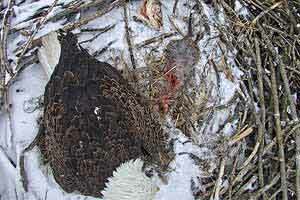 Eagles consume mainly fish and other vertebrates associated with aquatic ecosystems. Although eagles are no longer endangered, it is still important to understand their food and habitat needs in a variety of areas so wildlife managers can ensure their continued resurgence across the United States. The adult eagles tear food and feed the chicks until they have acquired the ability to self-feed. 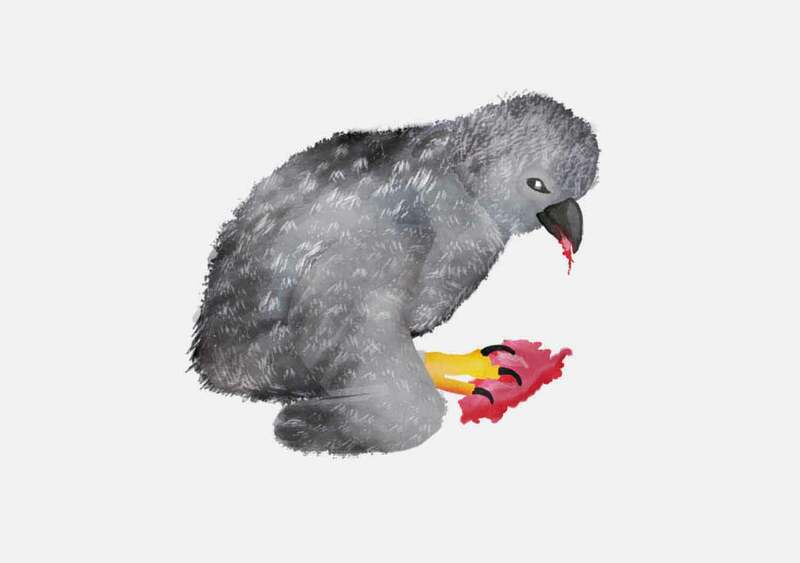 Self-feeding is a milestone that typically begins when the chicks are around 40 days old. The location of the nest at ND-LEEF is unusual in that there is only one nearby body of water, the St. Joseph River. 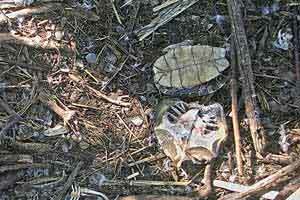 As such, the river is likely the pair’s prime hunting location. By analyzing both the species and sizes of the eagles’ prey, researchers will have a better idea of the diversity and availability of food to eagles. Fisheries managers survey the St. Joseph River every year to characterize the fish community. 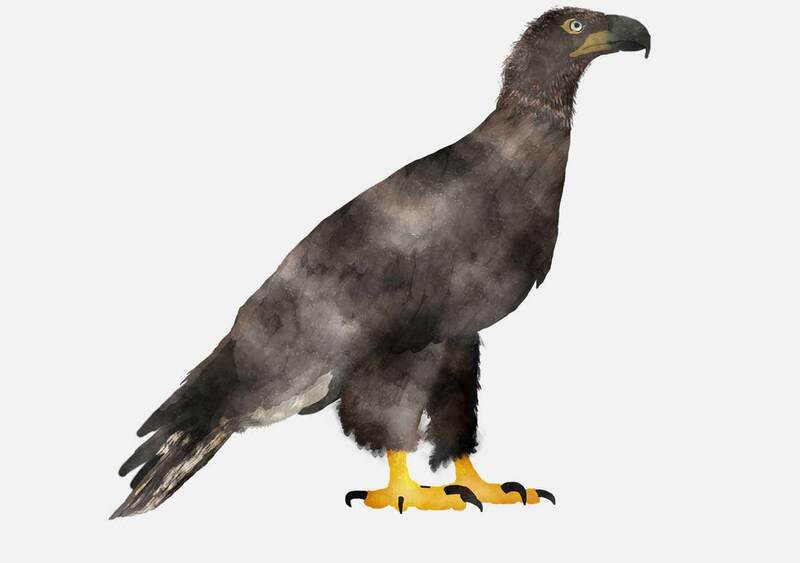 However, because eagles are constantly hunting the river for fish, they can provide a more complete picture of the fish community than traditional fisheries surveys, which use electrofishing and nets. Adult eagles will often eat the fish head themselves so the chicks do not get hard pieces of the spine caught in their esophagus. They then feeds the chicks the softer tissues of the fish. To accomplish these research goals, researchers programmed the in-nest camera to take five separate still images, capturing all areas of the nest every 20 minutes. This equates to roughly 38,000 still images that were taken from April through June 2018. Firas Houssein, an undergraduate student under the mentorship of Gary Lamberti, professor of biological sciences, and Brett Peters, assistant director of ND-LEEF, will comb through the images and identify when and what species of fish and other animals were brought into the nest. This research will provide a valuable data set on the ecology of rare bald eagles in northern Indiana, and support the goals of ND-LEEF to serve as a platform for interdisciplinary research and education for the region. Researchers aim to publish and present the findings. The first egg is laid in the nest at ND-LEEF. The second egg is laid three days later. 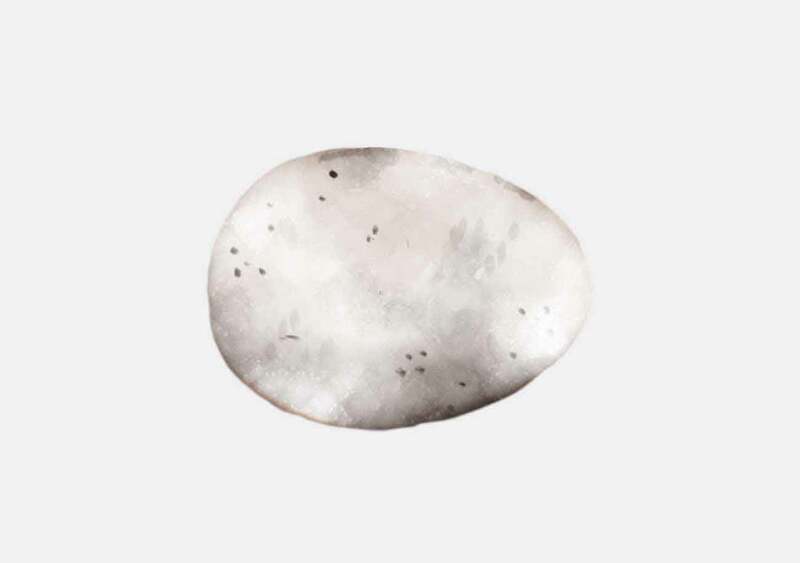 Eggs average about 3 inches long by 2 inches wide and weigh about 4 ounces. Both male and female eagles take turns incubating the eggs, maintaining egg temperature near 100 degrees Fahrenheit. 5 weeks after first egg laid. 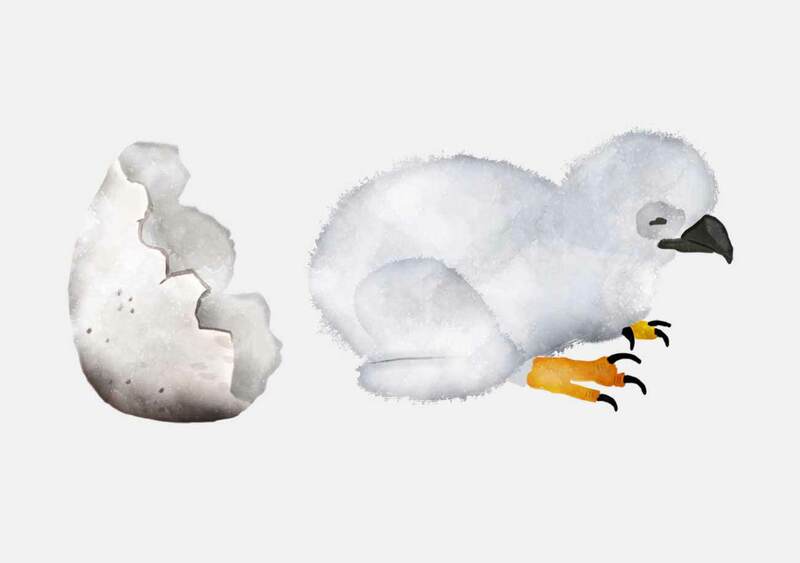 After an incubation period of 35 days, the eaglets peck a small pip hole through their egg shell. 5½ weeks after egg laid. The eggs hatch. 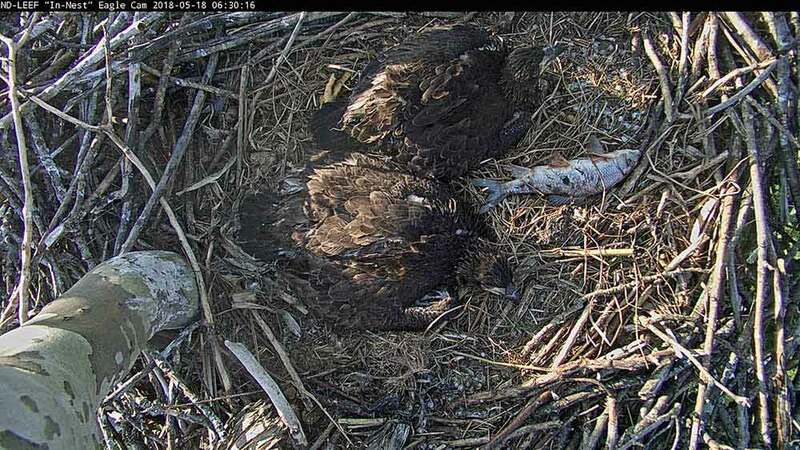 The first eaglet emerges before dusk, and the second eaglet at 1:00 in the afternoon. First 3 weeks out of the egg. 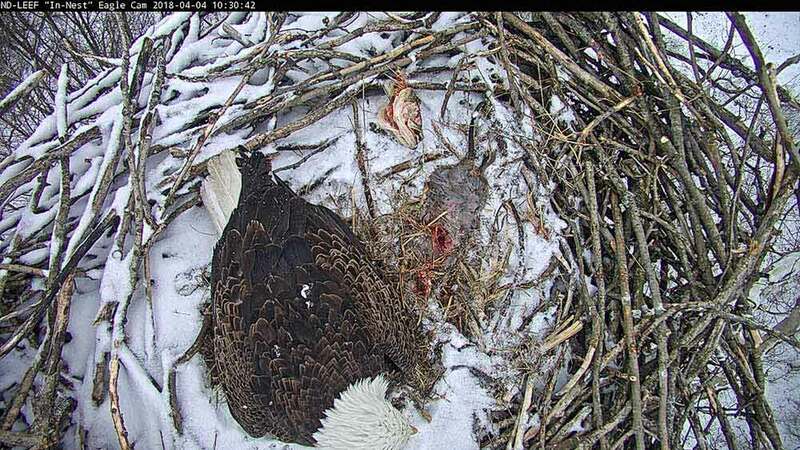 For a few weeks, one parent always remains in the nest, tearing prey into pieces and feeding directly to the eaglets. 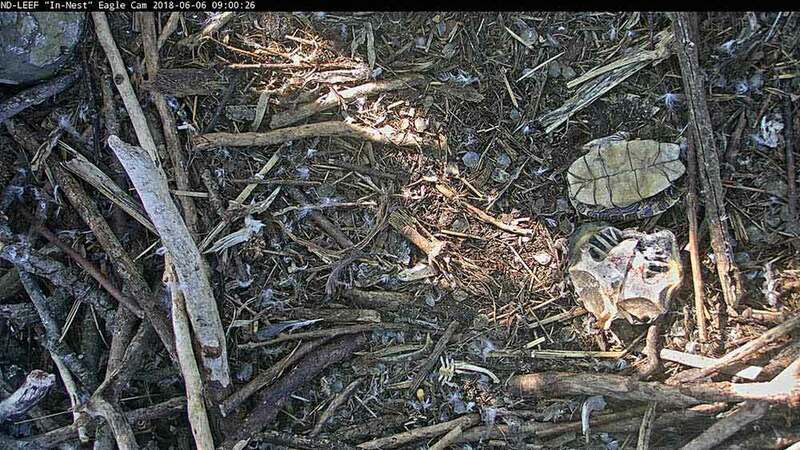 The eaglets transition from grey fluff to patches of brown feathers, and start to peck at food dropped in the nest. The eaglets begin to stand and move around the nest. 10 to 12 weeks old. The eaglets will take their first flight, or "fledge," and will develop skills for flying and hunting. In late summer, the eaglets will depart from the nest permanently. They are usually nomadic for the first four years of their lives. Bald eagles take five years to mature, and it isn't until they reach maturity that they develop their signature white head and tail feathers. To address the key environmental challenges of our time, scientists need a research facility that is larger than an indoor lab, yet more controllable than a natural stream, pond or wetland. 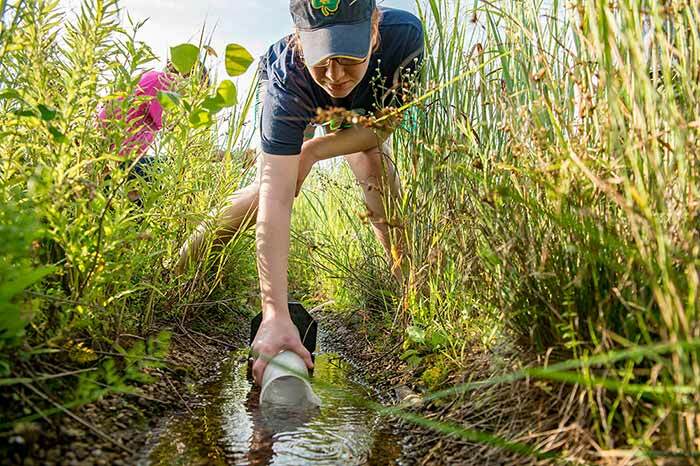 The Notre Dame Linked Experimental Ecosystem Facility, or ND-LEEF, strikes this balance — enabling researchers to help solve complex problems that involve invasive species, land use and climate change, and their impacts on freshwater. Bald eagle population significantly declined in the 1950s because of the use of pesticide, but in Indiana they have gone from 68 nesting pairs in 2007 to 300 nesting pairs in 2017. A program of the Notre Dame Environmental Change Initiative, ND-LEEF is a globally unique research facility that houses two artificial experimental watersheds, each consisting of an interconnected pond, stream and wetland. Ecosystems can be hydrologically connected or isolated, offering maximum flexibility in experimental design. Both experimental watersheds are roughly the length and width of a football field and are located five miles north of campus on six acres of land within St. Patrick’s County Park northwest of South Bend. ND-LEEF provides an unparalleled and versatile platform for faculty, graduate students and undergraduate students to perform cutting-edge aquatic and terrestrial field research in a setting that mimics nature, yet is highly controlled and easy to replicate. Why do eagles like it here? 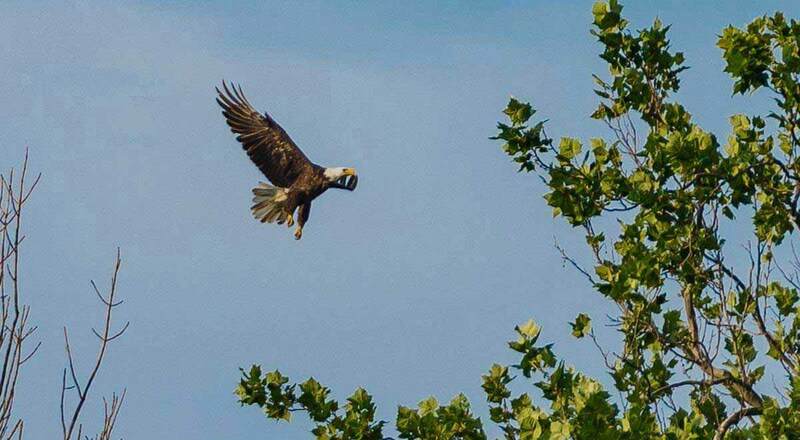 The quiet, natural setting and the proximity to the St. Joseph River are key factors that likely attracted the eagles to take over an existing red-tailed hawk nest at ND-LEEF in 2015. Throughout the design and operation of ND-LEEF, users of the facility have sought to have as light of a footprint as possible, and therefore mimic nature. For instance, by covering the site in native prairie, ND-LEEF is not mowed or fertilized and does not have herbicides applied, causing far less human disturbance. The successful nesting of the eagles at ND-LEEF over the past four years is a clear example of how Notre Dame integrates scientific research with care for the environment. 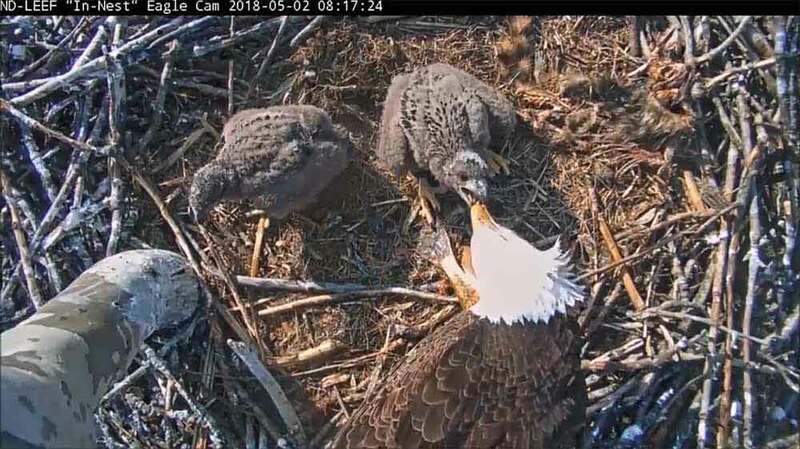 Researchers at ND-LEEF have also taken precautions to limit disruption of the eagles by delaying the start of the summer research season from March to May. The shift in timing helps limit disturbance when the eaglets are young and most vulnerable. Given the arrival of the bald eagles to ND-LEEF, the faculty have morphed its future site map to reposition where additional watersheds would be placed in order to minimize impact on the nesting pair. ND-LEEF also adheres to all guidelines provided by U.S. 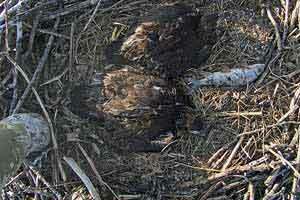 Fish and Wildlife Service regarding activity near an active bald eagle nest. Installed in fall 2017, ND-LEEF’s live, in-nest camera is mounted directly above the bald eagle nest. 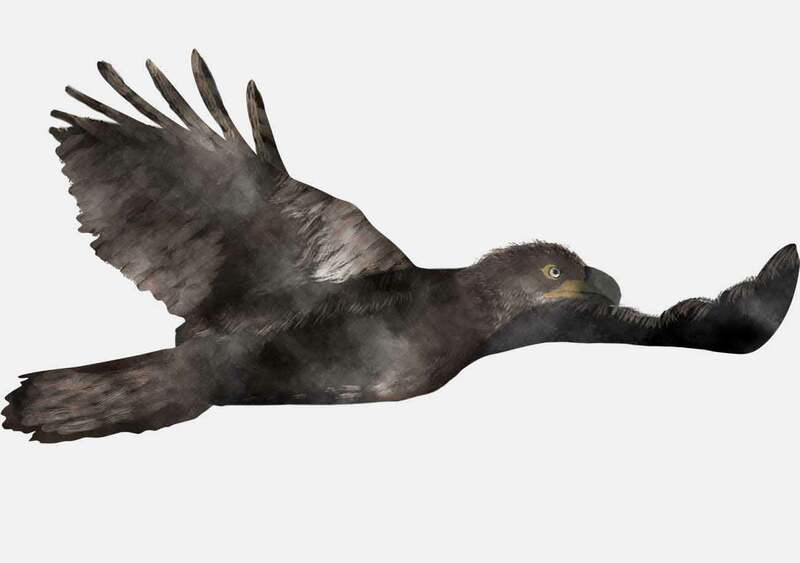 Viewers can follow the life of the eagles from the egg to the fledgling stage. 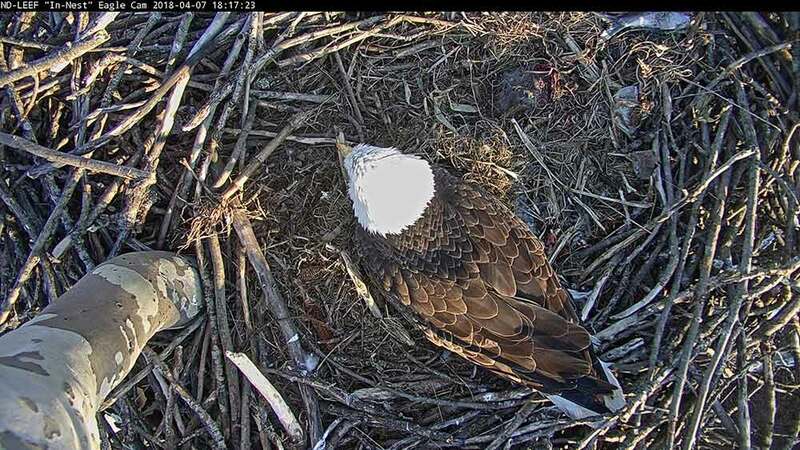 While the previous lateral camera was popular, its low angle prevented viewers from seeing eagles when in the nest and made it hard to see them when leaves were present in summer. Once the eagles left the nest for a month in the fall of 2017, a professional arborist rode a high-reach bucket truck up to the nest to install the camera. 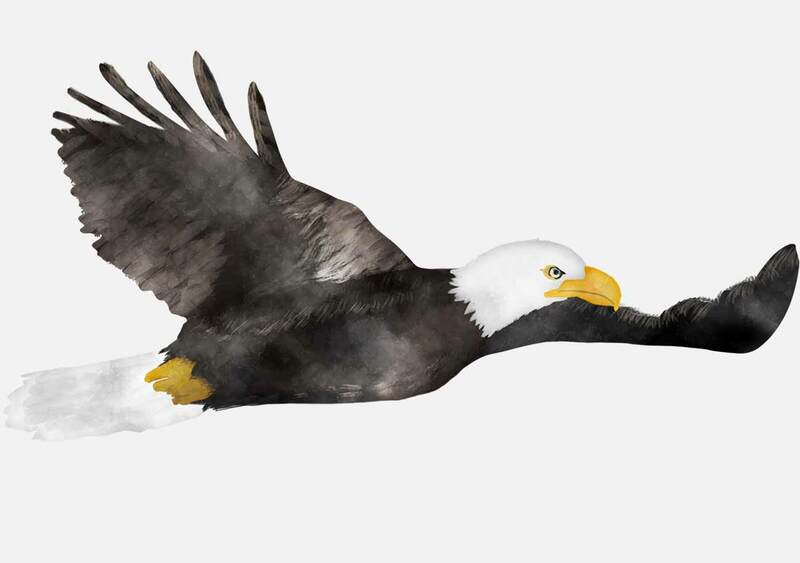 Based upon observation and migration patterns of bald eagles, leadership at ND-LEEF knew they had approximately one month to work while both the adult and juvenile eagles left the nest. 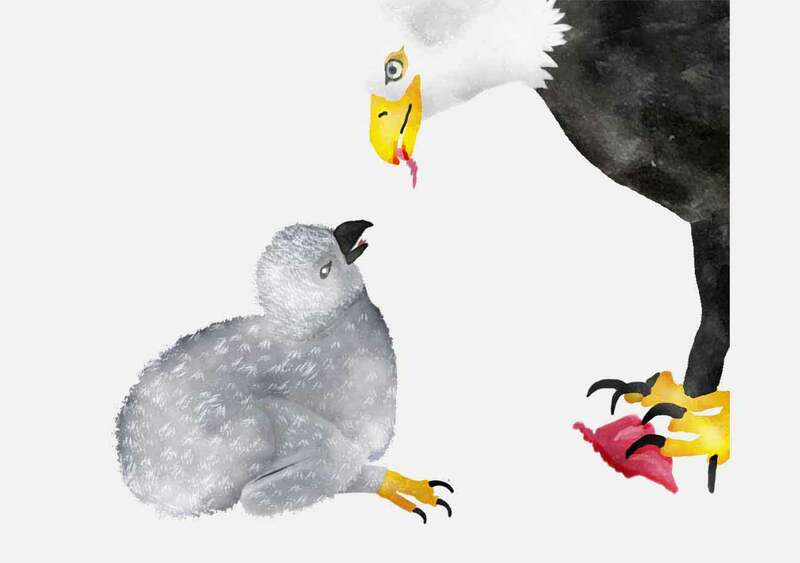 Once the logistics were set, the team patiently waited for the eagle family to depart. 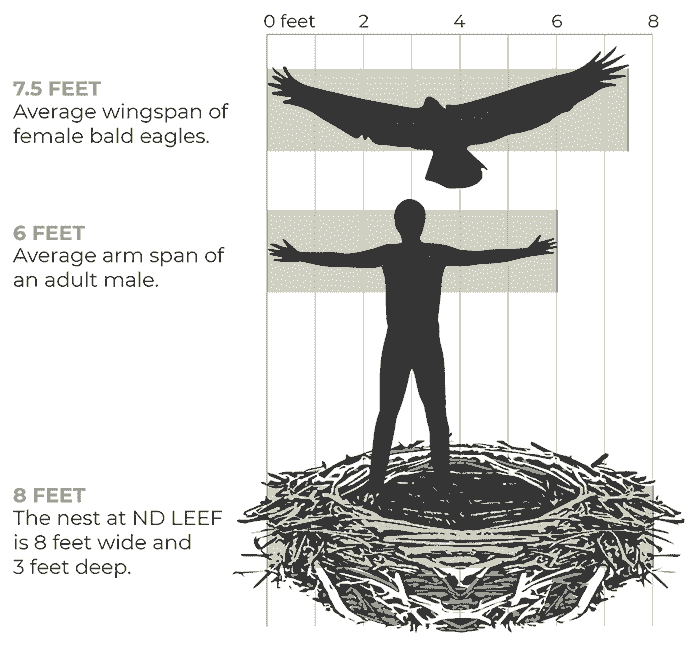 The eagles at ND-LEEF, as well as a pair from Potato Creek State Park south of South Bend, are the first successful bald eagle nests ever recorded in St. Joseph County. A high-reach bucket truck was used to place the installation team even with the nest, which spans 8 feet wide and 3 feet deep. From there, a professional arborist with raptor nest entry experience went the remaining few feet to get the camera positioned above the nest. 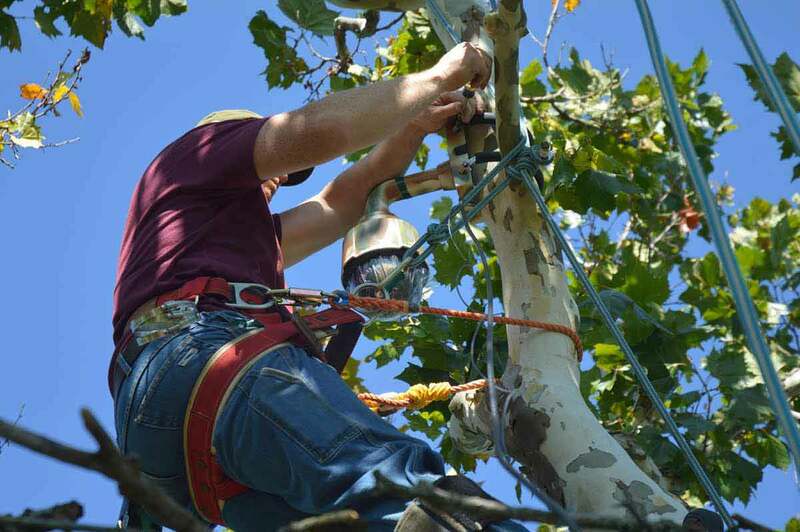 In addition to mounting the actual camera, a fiber optic network cable and 120v power were extended to the base of the tree. The new high-definition camera can pan 360 degrees, as well as tilt from vertical to horizontal and zoom. ND-LEEF was born out of a close partnership with St. Joseph County Parks as a means to achieve a joint goal of continued education. 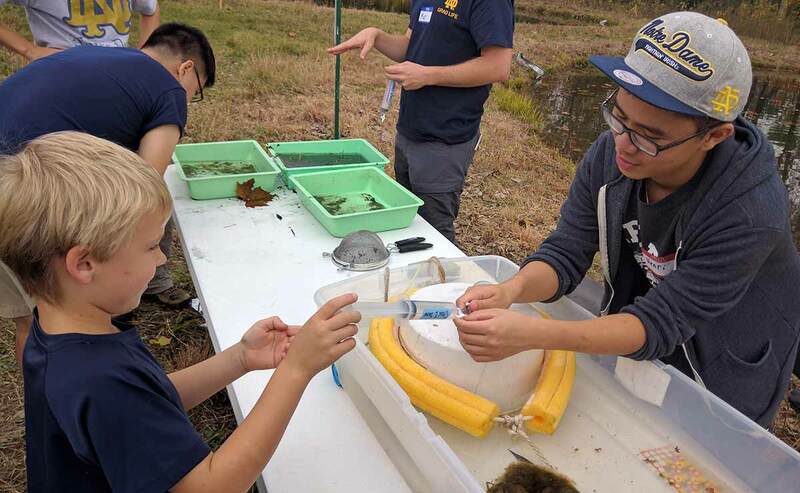 The facility provides an unrivaled opportunity for scientific and environmental outreach to regional school groups and other park visitors of all ages from South Bend, St. Joseph County and surrounding communities. ND-LEEF also serves as an important conduit for Notre Dame faculty, student and staff engagement with community-based research and learning opportunities. Assistant Director of ND-LEEF, Brett Peters, leads a community learning opportunity at the Morrison Family Education and Outreach Pavilion. Since its inception in 2013, ND-LEEF has collaborated with the parks department to host more than 50 outreach opportunities and has welcomed nearly 2,000 participants. Built in 2014, the Morrison Family Education and Outreach Pavilion serves as the hub for community outreach programming at ND-LEEF, and as a source of information about bald eagles, as well as current Notre Dame research. 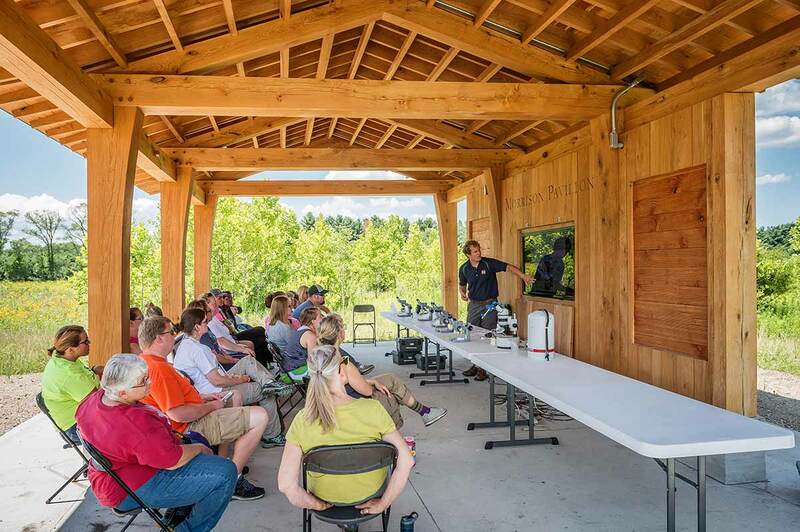 The community is invited view and learn about aquatic biology at the ND-LEEF facility. The arrival of the bald eagle pair at ND-LEEF continues to grow community engagement and education opportunities. For instance, the public has been invited to view and learn about the eagles through events such as Breakfast with Eagles and ND-LEEF’s annual Science Sunday. Participants of the latter are provided the opportunity to climb in a life-size bald eagle nest, try on fabric eagle wings and observe the nest via binoculars or spotting scope, while also learning facts and bald eagle history. 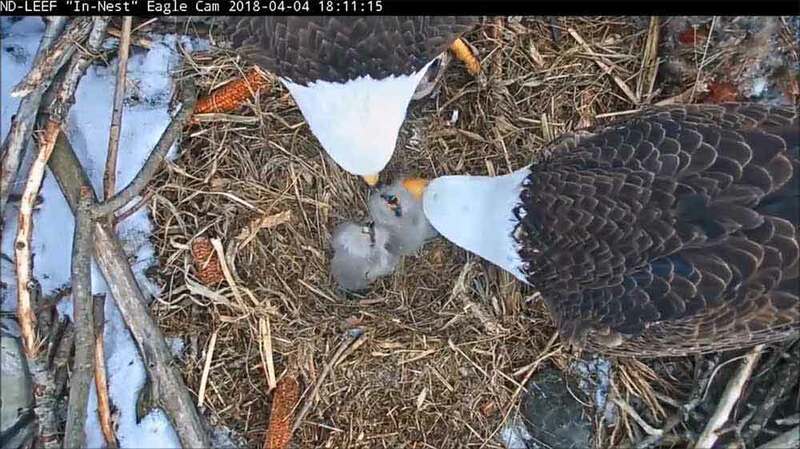 The in-nest eagle cam has been a successful outreach tool itself, allowing viewers from around the world to witness the amazing growth of the eaglets in the nest. Since its launch in fall 2017, the in-nest camera have been viewed more than 130,000 times on YouTube alone. 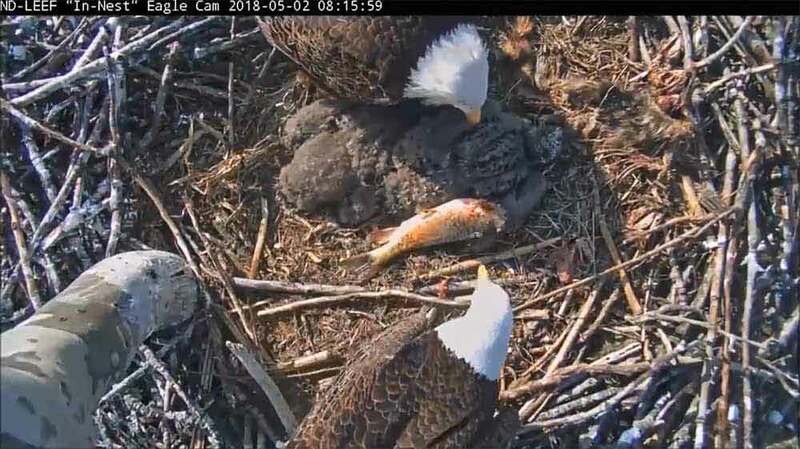 The livestream provides the public the opportunity to understand, appreciate and witness the natural habitat of bald eagles from afar, and invites people to visit ND-LEEF for an in-person, bird’s-eye view! 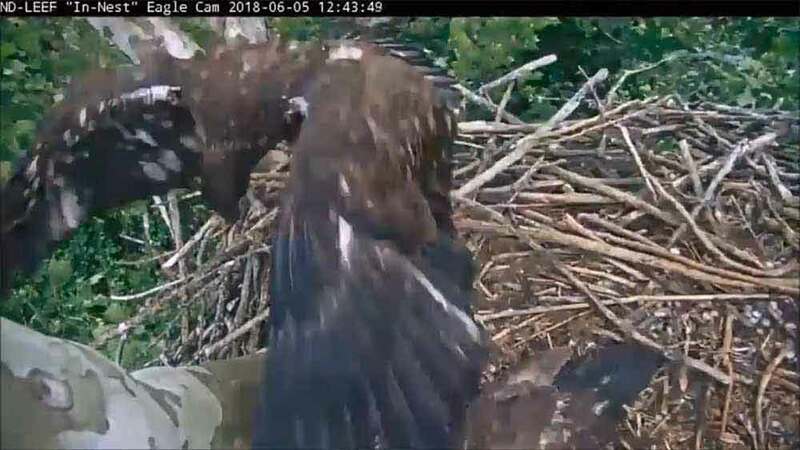 Eaglet “practicing” how to fly in the nest by beating their wings to build flight muscle. The camera’s popularity has also grown among online bird watchers and recently resulted in ND-LEEF Assistant Director Brett Peters being interviewed and fielding questions about ND-LEEF and bald eagles in a weekly YouTube broadcast. The ND-LEEF community enjoys weekly YouTube comments and social media messages from avid eagle watchers in places as far as Pennsylvania and Georgia. Faculty and students at ND-LEEF work hand-in-hand to do research that matters to society, answering critical environmental questions. We call it “Science Serving Society.” Ultimately, research at ND-LEEF aims to provide solutions that minimize the trade-offs between human welfare and environmental health where trade-offs are unavoidable, and to discover win-win solutions where they are possible. ND-LEEF is dedicated to utilizing research in conjunction with outreach, as a means to educate the public on the challenges related to environmental change, such as helping people and ecosystems adapt to climate change, mitigating the effects of land use change, predicting species occurrences in a shifting world and improving water quality. Scientists and students use ND-LEEF to conduct experiments in a field-like setting but in a more controlled environment than one can find in nature. 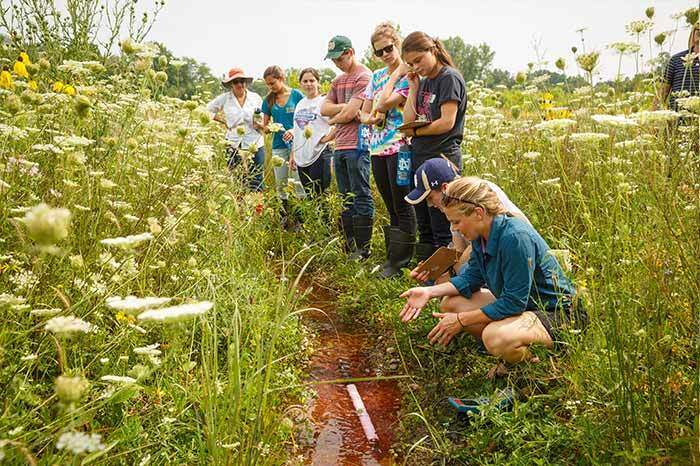 The facility is unique because the pond, stream and wetland in each watershed are connected—an experimental research design that is intended to mimic nature. Produced by the Office of Public Affairs and Communications and Notre Dame Research.